The Muslim Rights Concern (MURIC) has rejected Rev. Matthew Kukah’s initiative to train 10 million Almajiri children in Northern Nigeria. In a statement on Wednesday, MURIC Director, Prof. Ishaq Akintola, said that Rev. Kukah’s idea raises more questions than answers. According to him, the Kukah’s proposal is a ploy for evangelization, modern colonialism and a potential time bomb. “We all agree that something must be done about the Almajiri children. We can welcome ideas from everyone but the implementation must be in the hands of Muslims in the region. Any other thing will make the intention questionable. “We cannot pretend to be so naive as to entrust our Muslim children to the hands of Christian gospellers. As far as we are concerned, Kukah’s Almajiri dream is a Trojan horse. “These children have teachers even if the system is unconventional. The parents entrusted them to the teachers and learning still takes place somehow. “Can any Christian community allow an Islamic organization to take their children away just like that? What is the fate of the children taken from Chibok to an Edo IDP centre in 2014? “Whatever the situation may be, we wish to caution Northern Muslims, particularly the elders, never to allow it to happen. “Instead of allowing Christian missionaries to seize this kind of initiative, Northern Muslims should empower available Muslim NGOs to cater for Almajiri children. “We know from experience that whatever happens will be a point of reference in the near future. Who will bear the shame at that time? 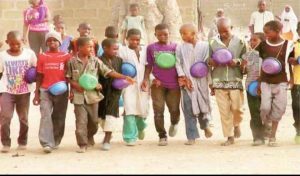 “We therefore advise state governments in the region to rearrange their priorities and concentrate on the education and welfare of Almajiri children,” Akintola said. While saying that it is indisputable fact that Almajiri is essentially a system practiced by northern Muslims and that it is not part of Christendom, he wondered if Rev. Kukah prefers to alleviate poverty among Muslims than doing same among Christians. “Is he (Kukah) telling us that he loves to assist Muslims more than he loves to help Christians? Can Rev. Kukah give any guarantee that those children will remain the same at the end of his intervention? It is modern colonialism. “When did the reverend father suddenly develop so much love for Muslims that he has now decided to give them preference above his Christian folks? He added there were no less than five NGOs that specialize in eliminating poverty among vulnerable people and that one of them, the Almajiri Child Right Initiative (ACRI), specializes in Almajiri affairs. He wondered if Rev. Kukah was unaware of the existence of these Muslim NGOs and what effort has he made to find them? “We have reliable information that some of the existing Muslim NGOs have made futile attempts to secure funding for similar projects from foreign donors. “Why would the same donors suddenly show interest in funding the initiative of a Christian reverend father while still ignoring those of genuine Muslim NGOs?” he queried. He therefore urged Rev. Kukah to take Muslim NGOs in the North into confidence, by among others co-opt some of them into a committee, allowed them to do the implementation while he and the donors monitor the use of funds for the project. He added that whatever training the almajiri children receive should include the learning of Arabic language and Islamic studies and that anything short of this is unacceptable.